Delivered at the Exercise Kakadu Fleet Commanders Conference, organised by RAN’s Sea Power Centre, on 1 September 2018 in Darwin, Australia. However we cut the geopolitical cloth to define our region — Asia, Eurasia, Asia-Pacific or Indo-Pacific — our marine operating environment is interconnected. The seas and oceans that define the Indo-Pacific macro-region — let’s call it that — form a fluid continuum. Forget, if you can for a moment, that you are servants of your respective countries. Try comprehending the maritime operating environment, as it looks from space, uninterrupted and borderless. This is my first, conceptual challenge to you. It’s harder than it sounds. The connectedness of the seas and oceans is a physical fact we continually lose sight of, because we have internalised the sub-division of sea-space into jurisdictional boxes and territorial enclosures. Your first call as defence professionals is to protect your nation’s maritime security and exclusive sovereign rights. To keep those with bad intentions at bay. However, the only fences at sea are the ones we mentally put there, as a highly territorial species hard-wired to think in proprietary terms. From the earliest times, humankind has used the sea as a source of food and a medium for transportation. The first Australians who settled here, millennia before Europeans arrived, came by sea. The Larrakia, who inhabit the region around Darwin, describe themselves as a “salt water people”. Makassans, from modern-day Indonesia, were later visitors to these shores, leaving their imprint in local aboriginal languages. The trepang trade tied Northern Australia into the economic fabric of the Malay Archipelago. We cannot ignore the riches of the sea, or the imperative to develop a “blue economy”. It is part of the human tradition, as old as the first migrations along Asia’s long littoral. But our contemporary activities in the marine environment intrude on a scale that compounds problems of maritime security and strategic competition. The UN Convention on the Law of the Sea (UNCLOS) — the closest we have to a world maritime constitution — upholds the principle that land dominates the sea. Our collective footprint stretches to the deepest of ocean trenches and the remotest of high seas. Only the polar extremities are unfished. The seas and oceans are our hunting grounds, and our dumping grounds. Will they become our battlegrounds once again? Over-fishing, over-heating, over-exploitation and pollution amount to a collective human assault on the marine environment. Land now subjugates the sea. Continental separation is no barrier to the ocean currents that heap plastics on pristine beaches thousands of miles from their source. Land reclamation has long been used to build up low-lying areas of coastline. It’s as old as Holland. Terra forming has been taken to new levels in the South China Sea, as submerged reefs have been dredged and concretised into air-sea complexes, smothering the marine life below. This is the territorialisation of international maritime space at its most literal and destructive. Our hyper-populated Indo-Pacific region is home to half the world’s people, the majority of whom live in the littoral. These waters are under the greatest strain. At present rates of exploitation, at the top of the food chain, we risk turning them into marine deserts. We need only look as far as the Great Barrier Reef to see the trouble we are in. International cooperation has never been more needed, to protect and secure our marine operating environment, as an integral, organic system. Just as we underestimate the fragility of the marine ecosystem at our peril, so it is with the ecosystems of humankind. The integrated maritime trading and security system that has underpinned Asia’s post-war economic success is brittle. Porosity has made it easy to take for granted, like oxygen or the weather. My second, more demanding, challenge to you is to understand the interplay between these organic and man-made ecosystems, and work to conserve them both. Geopolitical forces are fracturing our region. It is not clear if the old order can evolve to accommodate the new strategic realities, or what might replace it. We cannot assume there will be a single order in future. With the diffusion of power, a macro-region as diverse as the Indo-Pacific could fracture into multiple orders. That does not have to break the peace, but it will make the tasks of multinational maritime security cooperation more complicated. Transnational maritime security challenges are no respecters of imaginary fenceposts in the sea. Solutions to systemic problems go to the top of the command chain. That doesn’t let military professionals off the hook. Being war-fighters doesn’t absolve you of the agency to cooperate, to conserve — to be creative. You are also ship-drivers and diplomats in uniform, closer to the problems of maritime security than those giving the orders from dry land. You possess the knowledge to initiate and shape solutions, nationally and internationally, as only frontline practitioners can: bottom up, bridge-to-bridge, side-by-side. As inhabitants of the maritime environment, you are also responsible for it. The division of Earth’s seas and oceans into jurisdictional spaces is a political necessity, but still an artificial human imposition upon the natural order of the blue planet. At its core, UNCLOS represents a compromise between the interests of coastal and seafaring states, each seeking to project influence beyond the land. Over decades of deliberations, the Convention’s framers aimed to distil a legal framework that balanced rights to exploit offshore resources against high-seas rights of access, for commercial and military shipping. It was not their intention to prejudice one set of rights over the other, but to strike an enduring grand bargain, showing “due regard” to both sides. UNCLOS codifies a sloping scale of jurisdiction, from the extended continental shelf, to the EEZ, the territorial sea and internal waters. For archipelagic countries, like Fiji, Indonesia, Philippines and PNG, its effect was transformative. It remains an indispensable framework for regulating human activities upon the sea. Like any compromise, it is imperfect. This shows through in some ambiguous drafting. It betrays its age in places, as threats (from piracy, terrorism, cyber) have evolved, and technology has moved on. Some signatories honour it more in the breach than observance. Coastal states, including several in our region, appear determined to push maritime jurisdiction beyond what was agreed, shrinking the maritime commons. The tension in UNCLOS’ foundational compromise has not been resolved. It remains contested, in the EEZ and beyond. Sadly, the Convention has not stemmed the pillage of the seas. For all its shortcomings, UNCLOS is infinitely better than unregulated, anarchic competition. Though it lacks powers of adjudication or enforcement, the UNCLOS rule book has paved the way for peaceful dispute resolution among regional states, large and small: India/Bangladesh, Bangladesh/Myanmar, Malaysia/Singapore, Indonesia/Malaysia, Australia/Timor Leste. Our collective ingenuity for exploiting marine resources has also developed apace since the LOS Convention came into force, over two decades ago. Darwin’s changing face is proof of that, as the hub for Australia’s expanding offshore hydrocarbons export sector. Without the legal certainty of exclusive sovereign rights that UNCLOS provides, would any major oil and gas firm risk investing $10 billion in a 500m-long floating liquefied natural gasification facility? Because of UNCLOS, Shell’s Prelude is now operational, an engineering marvel stationed at the edge of Australia’s continental shelf, piped to a receiving terminal here in Darwin. There’s nothing illegitimate about responsibly exploiting resources in the water column and seabed. Managed sustainably, the seas proffer an abundance of wealth and jobs — 400,000 in Australia alone. Protecting marine resources, and the high-value infrastructure necessary to exploit them, will be an increasing demand on navies and coast guards, as we push further out into deeper, contested waters. Boundary disputes need not stand in the way of joint development. The redrawing of the maritime treaty between Australia and Timor Leste, expected to enter into force this year, is a pertinent example. We urgently need to develop models for joint conservation of the region’s living marine resources as well. Back to the conceptual challenge. Despite what I’ve said about national economic imperatives and legal entitlement, sailors, strategists, maritime jurists and politicians (especially) should not lose sight of the presumptuousness of claiming human dominion over the maritime element. Fundamentally, the sea is not ours to own or occupy in the same way as land. Most of you have sailed long distances here, from various points of the compass, to participate in Exercise Kakadu. None of you stopped at a crossroads or passed a checkpoint along the way, even transiting the busiest of international straits. Buoys and beacons that you passed were mostly there to mark the route for safe navigation. Your start and end points were fixed. Many will have opted for the shortest course, the quickest voyage, for the least fuel burned. But alternatives were always available for your transit. Time in transit is money and a potential opportunity cost. The naval choreography required to participate in Exercise Komodo, Malabar, RIMPAC, CARAT, SEACAT, FPDA, ADMM Plus or the upcoming ASEAN–China drill requires tight manoeuvring. No regional navy participates in all of these multilateral exercises. But we all participate in some. Finding ships to represent one’s country can be a challenge, with the accelerating demands of normal operations on top. Putting together these various engagements, in the optimal sequence, is like orchestrating a nautical and bureaucratic ballet. The challenge is significant for smaller navies less used to the long distances involved. To muster this many maritime nations from across the Indo-Pacific for Exercise Kakadu says something for Australia’s convening power. Australia is not well known for being near anywhere, including parts of itself. Darwin is equidistant from Melbourne and Singapore. Its “forward” location, as Australia’s window onto Southeast Asia commends it as a hub for Australia’s regional defence engagement, hosting exercises Pitch Black and Kakadu, as well as the US Marine rotational detachment for half the year. This year, representatives from the South Pacific are also here. This is especially good, as practitioners from Australia’s “near regions” are not brought together often enough. Some of you will have chosen a less direct route to Darwin, visiting another port along the way, to demonstrate presence, to re-provision, or as a sign of your government’s interest in pursuing partnerships, old and new. It’s possible that you were tasked mid-course to investigate a suspect vessel, with its transponder inactive — a potential smuggler, pirate or sanctions buster. You might even have diverted to respond to a distress signal. The sea grants this flexibility, this freedom of manoeuvre. It is our shared element. When the swell gets up, the sea becomes the common enemy, but common nonetheless. Sailors resemble members of a common order in ways their sister services do not. Like a white-clad cult of the sea. For outsiders, it’s tricky to tell you apart. For all that, navies are occasionally required to fight each other. In contemporary warfare they are unlikely to see their adversaries. If they do, someone has erred. Yet sailors must fight as hard as soldiers. For defeat at sea can be swift and total. Churchill said that only the navy can lose the war in an afternoon. That liability is no longer unique to navies in the cyber age. But the concentration of capability on board a modern surface combatant, or submarine, renders any loss painfully expensive (though less so in lives as crew sizes get smaller). Warships are more powerful than ever, but for the traditional naval powers there are fewer of them. In peacetime, that makes it harder, for traditional blue-water navies, to commit time, fuel and money to attend exercises and far-flung engagements. There is no redundancy in our calendars. Decisions, and their consequences, have the advantage of being clear-cut in wartime. In peacetime, as in civilian life, it is trickier to discriminate the desirable from the essential. The navy is a very sociable service, and the natural desire is to be in the “club”. Ingress is easier than egress. Navies’ unique flexibility also makes them popular with their political masters. This disperses your efforts along the spectrum, from deterrence via constabulary to diplomacy. Warships can additionally find themselves deployed, as capability demonstrators, in frontline service of a trade offensive. Strategy wears a dollar sign, as the saying goes. I’m sometimes asked, how likely is war between x and y, and invited to speculate about hypothetical armed conflicts. The more interesting and relevant question I am very rarely asked is: What kind of peace will there be in our region, and what role are navies to play in it? 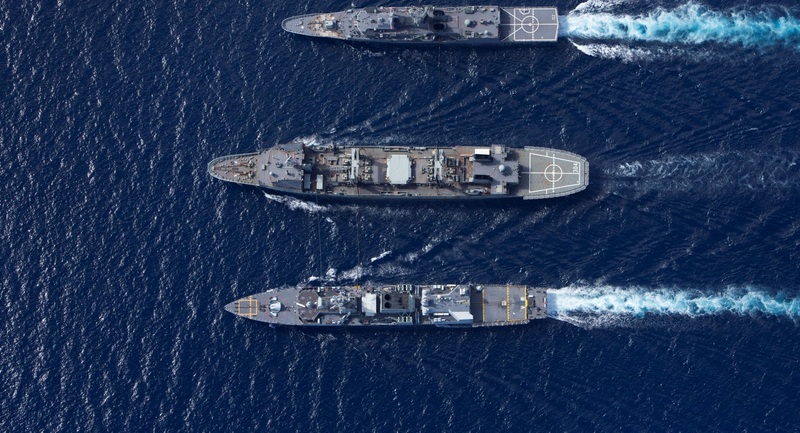 When geopolitics is growing steadily more strained, how can we ensure that the maritime operating environment remains integral, even when it is legally divisible? This is more than a rhetorical point about “hands across the sea”. The fact is that the biggest challenges to our maritime order cannot be tackled unilaterally, because of the interconnectedness of the seas and the oceans. Navies cannot “combat” climate change in any literal sense, either. We need to be on guard against falling into facile “non-traditional” security traps, on the other side of the ledger. The fact is blue water strategy is back and here to stay. But the maritime element matters far more to our security now than its traditional, mono-dimensional role as a space for strategic manoeuvre, and in ways that transgress the most orderly of boundaries. Nation states and the margins that define them are artificial, too. Land borders are often based on physical impediments to the movement of people, like rivers and mountains. Sometimes they are just arbitrary lines on a map. For maritime and island states the sea defines their geographical integrity more “naturally”. But all borders are projections of human territoriality. They enclose populations and resources in exclusive terms, as national spaces under sovereign control. Nation states are the highest expression of our human, tribal territoriality. They also blind us to the interconnectedness of things. Island nations are intrinsically connected, by water, to all of the coastlines on the planet. For civilizations that have invested in this endowment as a “glass half full”, access to the sea has been the source of economic, strategic and cultural advantage, even while retaining its defensive quality as a “moat”. Being surrounded by water can equally be a source of strategic vulnerability, or a cognitive handicap. The English word “insularity”, from the Latin “insula” for island, meaning “inward-looking”, conveys the problem. The sea can make a people strategically introverted, too. The insularity trap for island states applies far more for islands that happen to be continents. Australians’ consciousness never strays far from the beach, even where there are crocodiles. But that’s sometimes as far as it goes. How many Australians are aware that the extent of sea space under their exclusive jurisdiction — with the third-largest EEZ in the world — exceeds the country’s land area, once Antarctic waters are counted? Australians are serial travellers. The economy depends intimately on maritime trade, domestically as well as internationally. Australia’s population is itself profoundly internationalised, as a nation composed of overseas immigrants, more than a quarter of whom are first-generation arrivals. The fact that Australia is an island connected to a maritime trading and security system doesn’t stick in the public consciousness. When it registers, as with the proud ANZAC tradition of overseas military service, the folk memory is of land battles, fought far away. In a contemporary context, Australia’s “insularity” sometimes betrays a sense of insecurity. A good example is the attention devoted to illegal migration by boat. At its peak, Operation Sovereign Borders was a major draw on the resources of the Royal Australian Navy, stretching the authorities’ ability to police Australia’s outlying islands and approaches. Yet the overall numbers, in comparison with illicit migration flows elsewhere were comparatively low. The operation’s name tells its own story. Australia’s remote island geography is both a blessing and curse in the national psyche. The “tyranny of distance” has long unnerved Australians because they have felt far removed from the major power centres from which they have drawn their security. Since European settlement, Australia’s security has been founded on close ties with the leading sea power of the day. But they have always been at least an ocean away. The flipside of this isolation is a physical security cushion — a “sea/air gap” — that insulates the island continent from potential sources of threat. Darwin’s history is testament to Australia’s potential exposure to strategic threats. Yet, as with the weather, the shielding presence of a continental land mass has sheltered the bulk of the population from all but the biggest of conflagrations. Australia is an interesting country: it is coastal, maritime and continental — all rolled into one island package. I’d like to end where I began, with the framing of our regional geography. This matters in terms of identifying and ranking strategic priorities, threats, opportunities and the apportioning of resources to meet them. For most of its history since European settlement Australia has had to content itself with being a low-hanging appendage on the Mercator projection, shunted off to the bottom right-hand corner of the world map. That was a conceptual distortion, born of European bias. Canberra’s adoption of the Indo-Pacific as its strategic frame of reference, the first government to do so, belatedly corrects for this. Being restored to the centre of the map, at the confluence of the Indian and Pacific oceans is not simply a tonic for the national ego. It reflects the reality that the balance of global power has shifted “east”, to Indo-Asia and Pacific-Asia. The Indo-Pacific has an instinctive appeal for maritime practitioners, bound by Asia’s two great oceans, with the South China Sea as its geographic centrepiece. But to be widely accepted as the correct framing across our macro-maritime region, states must be convinced that the Indo-Pacific amounts to more than a geopolitical chessboard for the major powers’ conduct of maritime strategy. If it sells a bigger idea, it should be that our collective security depends on the indivisible health of the seas and oceans.